Choose the future of IYNF! 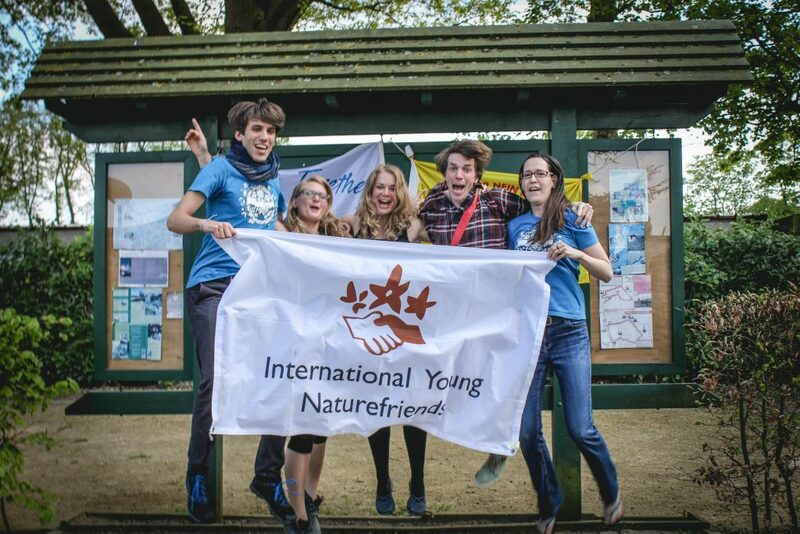 We would like to invite you to the IYNF General Assembly that will be organized on 12th May 2018 in a lovely Naturefriends house in Cecina, Italy, hosted by our Italian Member Organization GIAN-GIO. The IYNF General Assembly takes place bi-annually and represents the highest political body of the IYNF network. It primarily influences the future strategy and activities of the network via Motions that every member organization and body of IYNF can submit. The future of IYNF can also be influenced by electing a new Presidium of the organization, which will be an important part of the agenda. If you are eager for this two years life changing experience, being responsible for the future of the international Naturefriends movement the GA is your chance to get nominated from your local organization. The members of the network are most welcome to nominate their candidates for a role in the Presidium – as a President or Vice-President. 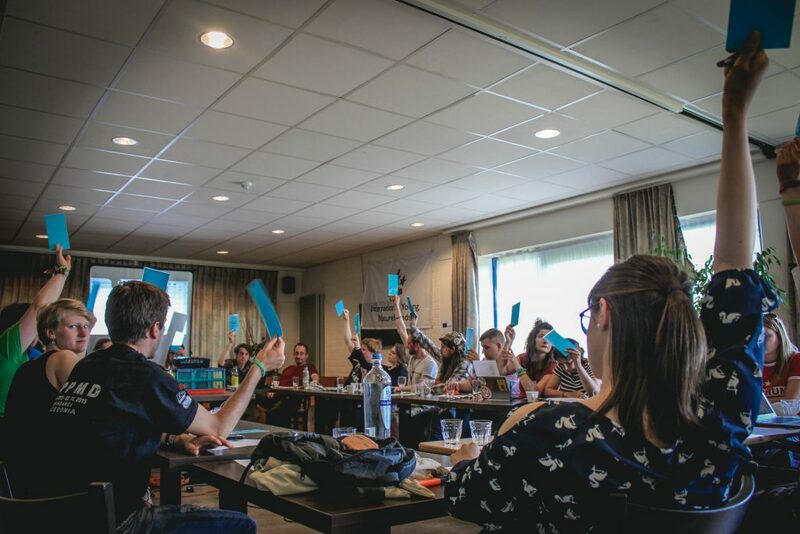 Motions at General Assembly are an effective tool how to influence IYNF´s strategy and policies, proposing the changes and improvements in the organisation, and IYNF members organizations can submit the motions for the General Assembly. If you wish to request further details for proceedings with motions, please request the full documentation from Henrique: henrique@iynf.org. 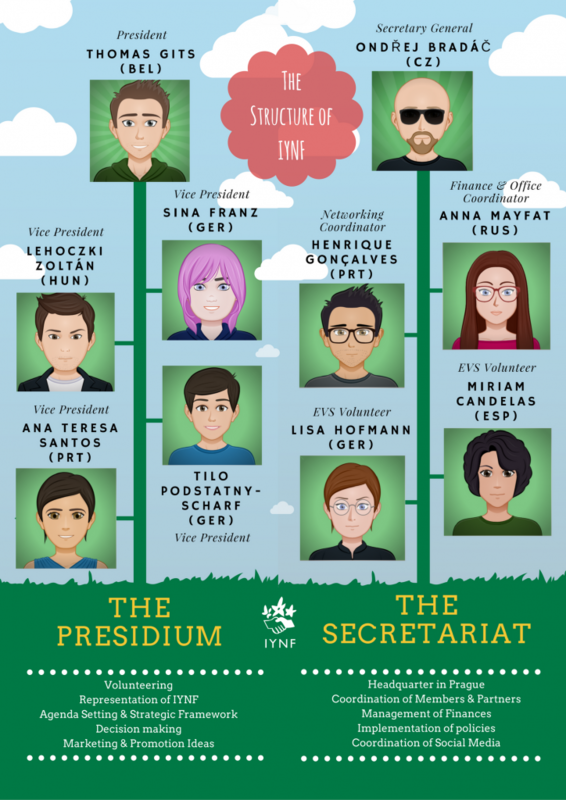 The two pillars that shape IYNF’s visions and missions are consisting of the Presidium and the Secretariat. The tasks of both sections are devided but also complement to another. The Presidium members have to represent IYNF on an external level, e.g. within the European Youth Forum, ERASMUS+, The Council of Europe and on conferences. Besides there are tasks in project management, writing grants and supporting international activities. The Presidium takes part in the selection process of new staff in the Secretariat and has an overview of the annual budget of IYNF. 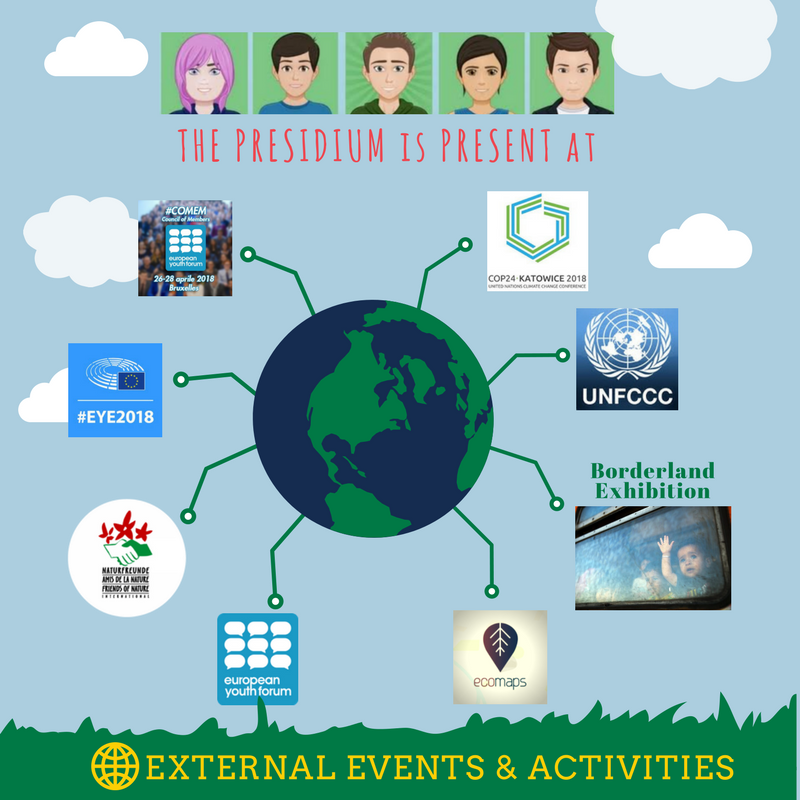 As new member of the Presidium you would also have to contribute with project management skills and facilitate activities, e.g. for the topic of the year in 2019 “IYNF – a colorful experience”. Our current Presidium is involved in ECOmaps, year topic: “Start With Yourself“, work camp in Frankfurt (July) and the meeting of the board of NFI and IYNF. As you may know, IYNF has many international partners apart from the Member and Partner organizations we have, so that we can further influence stakeholders on a European level. The European Youth Forum and the United Nations are the two largest international partners of IYNF. 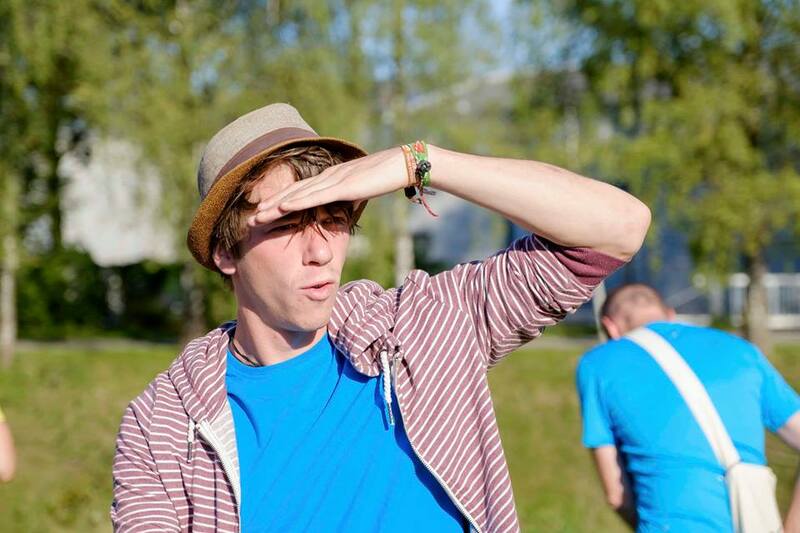 EYF carries the voice of young people in Europe and is fighting for the youth rights. 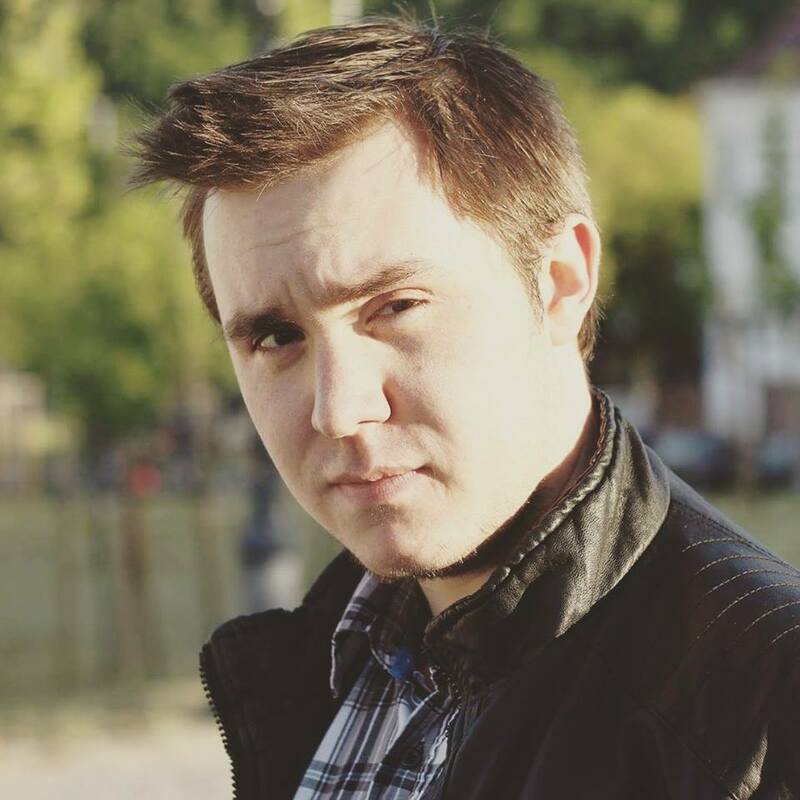 They reside in Brussels, organize COMEM twice a year and the European Youth Event in Strasbourg. The United Nations is responsible for the COP held by the UNFCCC, where we have a chance to take a closer look, on how countries assess the issue of climate change. At the same time, we are improving ECOmaps with more places and opportunities and we run the Borderlands exhibition about the refugee crisis, which was already shown to hundreds of people in four countries. 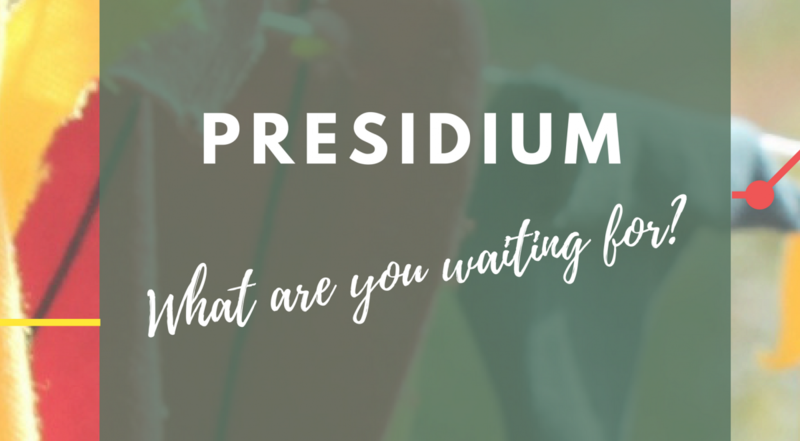 Would you like to join the IYNF Presidium? ready to commit for a 2-year period? 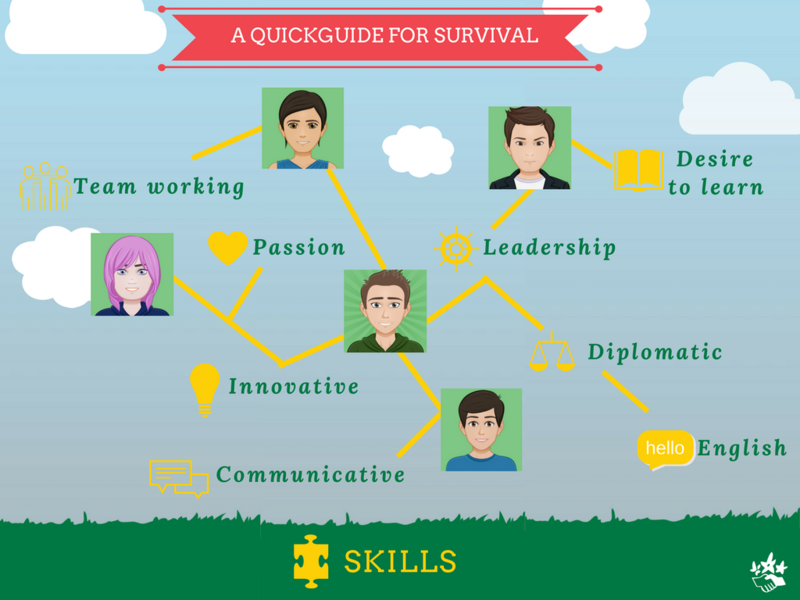 interested and motivated to get active internationally? experienced in youth work, preferably also with an international background? a team player who is also creative? happy to take responsibility and leadership? comfortable with communicating in English? free for 3 Presidium Meetings and 2 Networking Meetings per year as well as bi-weekly Skype meetings in the evening? ready for a big learning opportunity and an enriching experience? 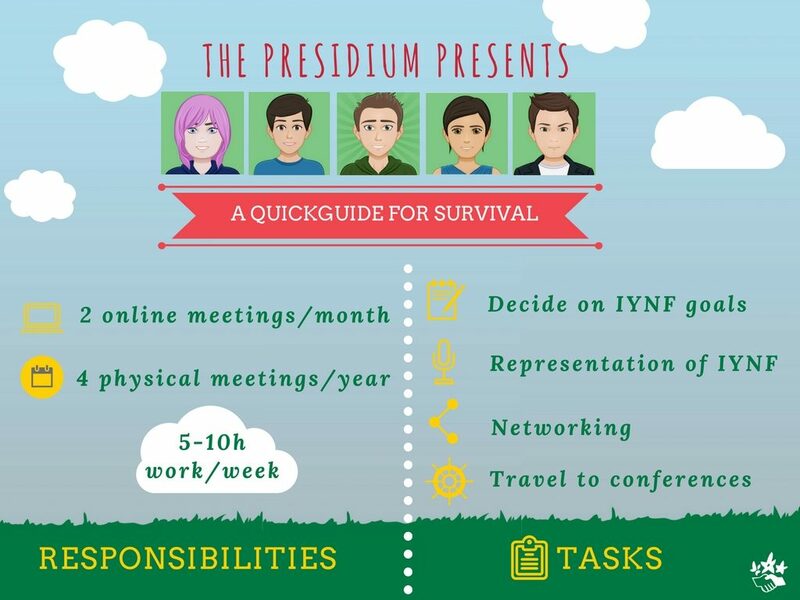 Then please don’t hesitate to contact us at presidium@iynf.org! Also please consult your decision with the national Member Organization if they are willing to put you as their candidate. Also, during GA the Youth Auditor will be elected at the Congress. For more information contact Henrique (henrique@iynf.org). Last Minute Delegation is still possible (if you organize your travel to Cecina!). Note: the travel costs of the Council members will be fully reimbursed, the council consist of one representative of each member organization. The other delegates travelling to the General Assembly are asked to be reimbursed by their sending organizations.